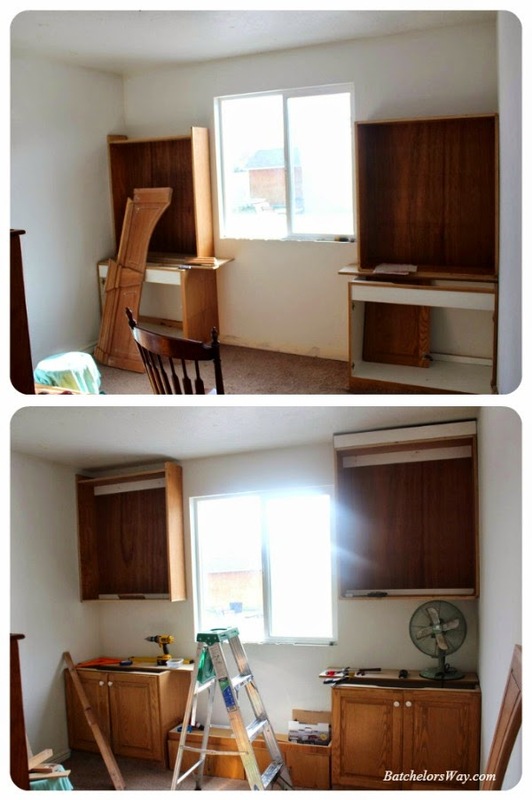 Last time, I showed how I find and collected my pieces for the built ins in Ashlee's room. Now let's see how we put them together. Here is the wall before we started. Nothing but your average wall with a window. I started by removing the outlet covers and then the baseboard on just this wall. Next, I carefully pulled up the carpet and pad, and laid it back out of the way. 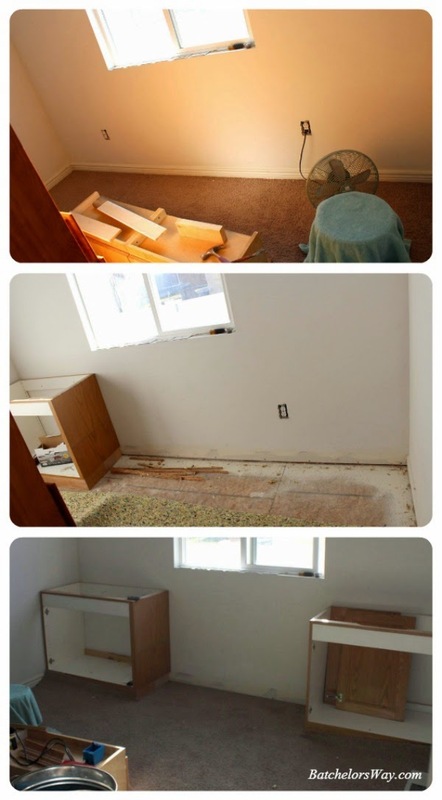 Once the sub floor was exposed I pulled up the tack strips and any nails or staples. And finally I cleaned and swept it. The base cabinets were originally bathroom cabinets, which meant they were 31 inches tall as opposed to kitchen cabinets which are usually 36 inches. I liked the height, so I left them at that height. They were 21 inches deep so my husband helped me cut 2 inches off the back, making them 19 inches deep. I then built out the toe kicks flush with the front, because I felt like the recessed toe kick made them look to much like kitchen cabinets. 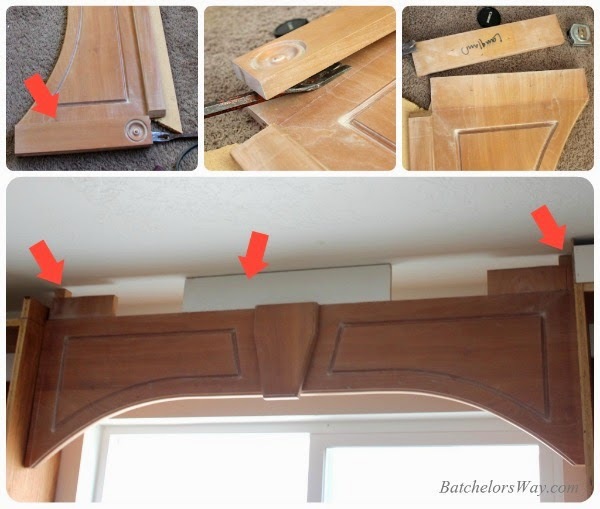 I think paying attention to little details like this will make your built ins look custom. Once I had finished altering the base cabinets I put them in place, marked the baseboards on the side walls and cut them out. Then I could install the cabinets snug in the corners. Les then cut the carpet and pad, and temporarily flopped it back in place. Now it was time to work on that free book shelf from my sister. 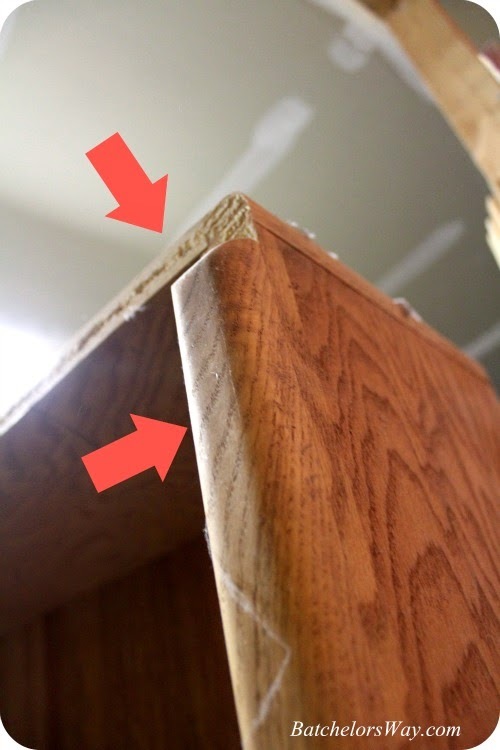 The book shelf was oak and really well made, but it was the typical 90's Oak bookcase with rounded trim. We started by ripping it off and after a few calculations and measurements we marked it and cut it in half with our circular saw. we found two pieces of wood for the new bottoms of our two shelves. ......and we had two bookcases. After a great test fit we added some ledgers to help with the installation. We also added headers to support the future crown molding. Moving on to the arch!! Can I just say I bought this close to a year ago in hopes of being able to use it for Ashlee's built ins. My husband can get a little annoyed at storing all my treasures for future projects, so I kinda hid it up in the attic out of the way!!! But now it was time to make this baby work. It was too big and needed to be cut down. I didn't want to cut the trim piece with the circle detail, that would look funny, so off it came!! Once I had pried it off I just measured and cut both ends off. In order to install this I searched the scrap wood bin again and mounted two sticks, one on either bookshelf. I pushed the arch up against my mounting sticks and nailed it in from the front. It fits like a glove!! I also added supports for the crown molding again. At this point I start getting excited, 'cause I can see it taking shape. But be prepared, others will still think you are crazy because all they see a mess of odd pieces!! We have so much more, the window seat, and lots of details that make a difference. Okay, what exactly is a ledger? You mentioned it on a previous project also. I'm wondering if you mean ledge? I even googled it, and did not find anything.